The MAG TFV12 Baby 50W TC Starter Kit is the latest mod kit to come from Smok. 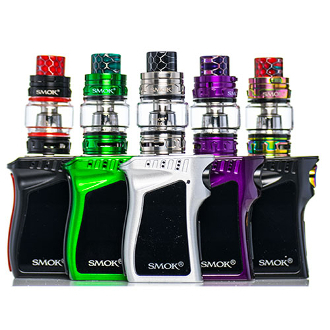 It is a powerful kit that pairs the SMOK TFV12 Baby Prince Tank with the SMOK Mag Baby Mod Box. Both deliver top-notch clouds and power at the press of a button. The SMOK TFV12 Baby Prince Tank is 510 threaded and has a Wide Bore Cobra Resin Drip Tip. It is constructed of stainless steel and glass that is durable and produces tasty mouthfuls of vapor. This tank has two e-liquid capacities depending on which glass tube you utilize. When using the bubble glass tube, this tank will have a 4.5ml capacity. If you use the standard glass tube instead, the tank will have a 3ml capacity. This tank has a top fill design with a locking mechanism to help safeguard against leaks. It also has a large center airflow chamber and dual adjustable airflow slots to help with large cloud production. SMOK Mag Baby Mod Box has a built-in 1600mAh battery with a wattage range of 1.0 - 50.0W and an output voltage of 0.5 - 9.0V. It utilizes temperature control and can be used with Nickel 200 / Titanium / Stainless Steel / TCR. By the way, it has a temperature control range of 200 - 600F and a resistance range of 0.05 - 2.0ohm for Temperature Control Mode and 0.1 - 2.5ohm for Variable Wattage. This box mod also has several protection features including Low Voltage and Short Circuit protection. Aesthetically, this box mod has an ergonomic design with a larger trigger-style fire button for more comfortability. The MAG Baby Mod Box has a 0.96" OLED screen that has a puff monitoring feature. To charge, simply use the micro USB port. Be sure to only use the designated charging cable provided. This will ensure no damage to your battery will occur by using the wrong charger.